You know what World War II games need more of? Dinosaurs. Specifically, Nazi dinosaurs, the kind one can send into multiplayer battles, huge cannons strapped to their cold-blooded endothermic backs! We'll do so with Dino D-Day, the long in the making multiplayer mod for Valve's Source engine. Dino D-Day will officially release on April 8 via Steam, but you can pre-order the game as of right now, cheaply. The PC game pits nine human classes and three dinosaur classes... er, species—Velociraptor, Dilophosaur, Desmatosuchus—in mortal combat with 26 WWII era-appropriate weapons and presumably accurate reptilian melee attacks. If you'd like a taste of Dino D-Day's Axis vs. Allies vs. dinosaur gameplay, a single-player Half-Life 2 mod is already available for download. 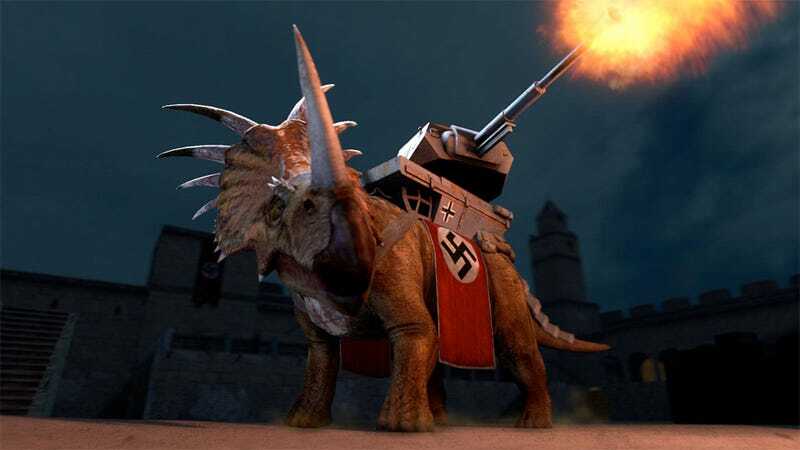 If the developer had you at "Nazi dinosaur army," grab it for under twenty bucks American via Steam.